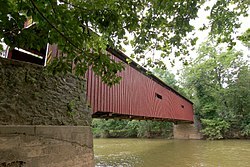 Pinetown Bushong's Mill Covered Bridge over the Conestoga River in Manheim Township. Manheim Township is represented by Republican United States Representative Lloyd Smucker. Manheim Township is located within Pennsylvania House of Representatives District 97 represented by Republican Steven Mentzer and Pennsylvania Senate District 13 also represented by a Republican, Scott Martin. Residents of Manheim Township elect a five-member Board of Commissioners. Commissioners are elected to serve a four-year term. According to the United States Census Bureau, the township has a total area of 24.3 square miles (62.9 km²), of which, 24.2 square miles (62.7 km²) of it is land and 0.1 square miles (0.2 km²) of it (0.33%) is water. Manheim Township does not have its own zip code, therefore its residents share postal designations with neighboring municipalities. 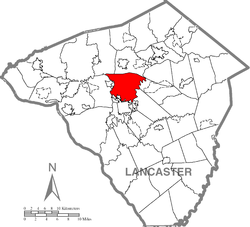 Residents living in the northernmost parts of the township have a Lititz address, residents living in the central and southern parts of the township have a Lancaster address and residents living in the easternmost parts of the township have a Leola address. The unincorporated community of Neffsville is located within Manheim Township. As of the census of 2000, there were 33,697 people, 12,961 households, and 9,280 families residing in the township. The population density was 1,391.6 people per square mile (537.4/km²). There were 13,434 housing units at an average density of 554.8/sq mi (214.2/km²). The racial makeup of the township was 93.18% White, 1.46% African American, 0.11% Native American, 3.13% Asian, 0.01% Pacific Islander, 1.02% from other races, and 1.09% from two or more races. Hispanic or Latino of any race were 2.77% of the population. There were 12,961 households, out of which 31.0% had children under the age of 18 living with them, 63.1% were married couples living together, 6.4% had a female householder with no husband present, and 28.4% were non-families. 24.8% of all households were made up of individuals, and 12.8% had someone living alone who was 65 years of age or older. The average household size was 2.47 and the average family size was 2.96. In the township the population was spread out, with 23.2% under the age of 18, 5.8% from 18 to 24, 24.9% from 25 to 44, 25.2% from 45 to 64, and 21.0% who were 65 years of age or older. The median age was 43 years. For every 100 females, there were 88.3 males. For every 100 females age 18 and over, there were 83.7 males. The Manheim Township Board of School Directors articulates the policy, budgetary direction and vision for the school district. It has nine members, elected to terms of four years each. ^ a b "Election Returns available". Ice1.co.lancaster.pa.us. Archived from the original on 2012-07-23. Retrieved 2012-11-08. ^ "The United States Postal Service (U.S. Postal Service)". USPS. Retrieved 2012-11-08. ^ "Manheim Township School District | The Mission of the Manheim Township School District is to provide an environment where everyone will learn, grow, and succeed". Mtwp.net. Retrieved 2012-11-08. ^ "Manheim Township School District - School Board". Mtwp.net. Retrieved 2012-11-08. This page was last edited on 11 May 2018, at 00:09 (UTC).